We all must live with the choices we make. This is what we teach our kids, and we, the adults, should live our message. 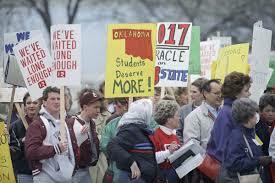 Today’s walk-out by teachers in Oklahoma is about choices, not money. One could make the argument that in a state like West Virginia, where the economy has been in decline for decades, finding the money to increase teacher salaries to a living wage was a real challenge. I have no idea what budget choices West Virginians have made over time, or how they found the extra funds to give teachers a recent pay raise. I’m sure those were tough decisions, even with the modest results to which all sides agreed. It was unfortunate that a strike was needed there for the voices of the many to be heard in support of teachers and the students they serve. On a state level, the inflation-adjusted general funding per student in Oklahoma dropped by 28.2 percent between 2008 and 2018, the biggest cut of any state, according to the nonpartisan Center on Budget and Policy Priorities. Oklahoma has very specifically chosen to decrease the money in state coffers under the theory that lower state taxes would lead to historic growth in the private sector and larger state budgets. It did not work, and one impact of that choice is coming to roost as teachers finally lose patience. Tea Party conservatives thinks there is an easy answer: cut government and taxes and still have the services that Americans have come to expect over the last 70 years. Various groups on the far left think there is an easy answer: gut free market systems and still have a thriving economy which supports those same services. Both are wrong. The polarization of America is nurtured by those who make idealogical choices that are not supported by reality, by people who make choices of immediate expediency without following the results of their choices to inevitable conclusions. The walk-outs today in Oklahoma and Kentucky represent those inevitable conclusions. Hopefully the good people of these states will collectively come back from the margins of thinking and experience and closer to a middle path. We are testing the limits of the choices we make in America today, and I fear for any society that puts education of its young people, and support for those who we entrust for that education, at the low end of the ladder of choices.